in Matlacha for many years. 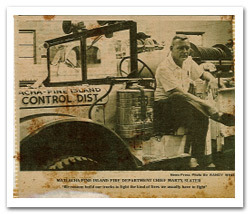 A few short years later in 1963, Marty Slater (Champine’s stepson) became the Chief. district in Matlacha and Pine Island. At that time in 1963 the members of the Fire Board were: Chairman Ted Smith, Marty Slater, Gary Parker, Truman Wheeler, Hubert Mascoe, and Clarence Hansel. 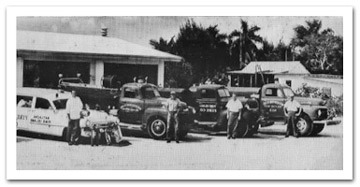 The board purchased a 1941 Cadillac hearse from Englehardt Funeral home in Ft. Myers to be used as an ambulance. The ambulance service sold tickets for $3.00 to finance the service and there was no charge for the ambulance if you had prepaid for a ticket. The ambulance personnel in those days had no formal medical training other than Red Cross or Boy Scout training. $5.00 tickets were also sold for fire protection. 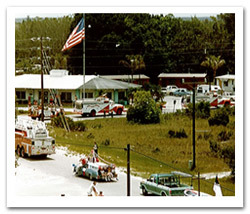 Different types of fund raisers were held through the 1960s and early 70s from chicken frys in Matlacha to turkey shoots at what is now The Nestings, a subdivision behind the current Fire Station 1. Chief Slater guided the building of “brush buggies” from military surplus vehicles. There were 18 surplus military vehicles that were scavenged to put together a handful of “brush buggies." This work of designing and building the “brush buggies” and fire engines continued for many years through the dedication and talents of several mechanics including: Burford, Frank Clay, and Dale Jedlick. In 1976 in celebration of the Bicentennial and in an attempt to raise money and awareness for the Department, members of the Department with the assistance of then Chairman of the Lee County Commission, Doug Taylor, decided to “secede” from Lee County. Many good stories were written in the News-Press by now world renowned author Randy White, about the "secession" of Pine Island from Lee County. Two cannons were purchased from the Tennessee Gunworks to fire tennis balls at residents from Sanibel, who were "attacking" by boats from the south. Firework shows and dances at Matlacha Park were also some of the events used to build revenue for the District during Fourth of July celebrations. Chief Marty Slater was extremely influential in the building and recruitment of personnel for the Department. He started a Firematics competition team from young men on the island for a twofold reason: to recruit people to be firefighters and to give the young men a direction in life. The firematics team competed throughout the State of Florida in timed events ranging from bucket brigades to ladder climbing. They were very successful in winning most of the competitions statewide. Some team members (from Gary Parker’s memory) included: Clint Simmons, Larry, Crosey, Ronnie Fields, Mike Zubal, Petey Meiers, Skip Reynolds, Pete Suto, Olin Thomas Sr., Olin Thomas Jr., Bobby Holloway, Tim Larrimore, Buckshot Thompson, Bruce Thompson, and several other members whose names cannot be remembered. Some other members of the Department from those early building years included: Wally Goodspeed, Art Rivard, Keith Bartlett, Tex Simmons, “Violin Case” Palumbo, Steve Poppell, Gary Grochowski. This is by no means a complete list of names of the dedicated volunteers who were involved with the Department. The District is in the process of establishing a plaque listing all influential members and the volunteers from the early days. Please contact the Department with any names and dates you may have of members of those early years.